The Kimberley Rock Art Sequence and terminology has been used for many years as the basic reference for discussion on respective rock-art motifs, groups, periods and epochs. Grahame Walsh, who spent 30 years in the field researching rock art accompanied often by traditional owners, established this Rock Art Sequence and terminology as he uncovered different styles and different periods of rock art which had not been documented previously. From this work, rock art enthusiasts and researchers continued to use Walsh’s terminology which became, until recently, the common and well accepted descriptions of the various figures, epochs, periods and styles of paintings. This methodology was first published in Bradshaws: Ancient Rock Painting of Northwest Australia, Walsh, Grahame L (1994). More recently, researchers and scientists in the field of rock art research have brought their own descriptions and terminology to describe some rock art traditions. Some names and suggested ages for the rock art will likely change over time. A more recent approach to terminology can be found at Rock Art Styles. The paintings labelled ‘Bradshaw’ by the scientists of the Frobenius Institute expedition in 1938 are also know as ‘Gwion’. Gwion is a Ngarinyin word for the Sandstone Shrike Thrush; legend has it that the Gwion paintings were painted by the Sandstone Shrike Thrush with a bloody beak. The following text and subsections are taken and adapted from Grahame L. Walsh’s publication, Bradshaw Art of the Kimberley. The tripartite division of the primary Kimberley cultural sequence is based on broad cultural Epochs, which are defined by collectives of artistic, stylistic and thematic commonalities. Their terminology indicates the representative factor inferred from the epoch’s art. Epochs are separated by clear divisions of major change, which appear to have been accompanied by periods of discontinuity. Each of the three cultural Epochs is in turn subdivided into two stylistic Periods. These definable Periods suggest transition within an apparent single culture, rather than dramatic changes between cultures. Periods are identified by finer (but still definable) divisions based on similar artistic, stylistic and thematic aspects. The Erudite Epoch art, for example, consists of a number of defined Groups and Sub-Groups, which in most cases can now be satisfactorily linked by a range of stylistic traits and elements through a definable order. This is not intended to infer that this sequence involved a series of groups which ‘evolved’ in orderly form from one to another. Nor is it suggested that there was always only a single group of figures artistically in vogue in Kimberley at any given time. Evidence suggests that there were times when at least one primary Group and more than one Sub-Group were depicted during the same time. The Archaic Epoch commences with the earliest surviving forms of Kimberley artistic expression and modification of the surfaces of rock shelters. These may well be found to have been preceded by much earlier periods of hominid habitation, either predating the development of rock art, or where artistic forms are no longer discernible. Sufficient evidence exists to warrant classification of the Archaic Epoch into two discrete artistic periods, the Pecked Cupule Period and the Irregular Infill Animal Period, both of which appear to have been of considerable duration. Due to the totally different application techniques and the use of very different surfaces during the two periods, it is not possible at this time to positively determine if there was a clear cut development of painted art, or whether the two art forms overlapped. Throughout the Kimberley, many examples of varying forms and arrangements of functional and non-functional Cupules, Pits and Hollows are found. Larger wall panels of Pecked Cupules in the Kimberley are commonly associated with shelters which have reasonable areas of sandy floors. There appears to be a direct relationship between suitable habitation (or gathering) areas and intense applications of this art form. It is not uncommon for these types of habitation shelters to have been re-used in the later Wandina Period, where artists have sought similar soft-floored shelters for their culture’s art and ceremonial purposes. Overlying Pecked Cupules are the multiple stratified layers of oxalate skins, varying from light caramel to dark brown, indicating additional elements settling from the surrounding environment at differing times in prehistory. If the Pecked Cupules are proven to represent the earliest surviving art form in Kimberley, their human-modified concave surfaces may well have served as receptacles for airborne microscopic particles, thus creating mini time capsules, retaining records of the environmental response to a human presence in Australia. The Irregular Infill Animal (IIA) Period marks the commencement of the oldest surviving Kimberley painted rock art. The Irregular Infill Animal Period’s name originates from the distinctive characteristics associated with its freehand depictions. Artists used long, flowing brushstrokes to create motif outlines, applying solid infill to head, tail and limb areas, while body cavities were rendered with a stippled irregular infill. Naturalistic forms were often larger than life, and with wildlife themes, particular attention was paid to depicting fine detail of feet, paws, fins and bodily extremities. An inventory of freehand subjects, in descending frequency of depiction, would list fish, macropods, yams, echidna, ring-tail rock-haunting possums, and lesser numbers of long-neck tortoise, lizards, snakes, thylacines and unidentified small marsupials. Birds, flying fox and possible Tasmanian devils are rare occurrences. Anthropomorphous forms are present, but in very small numbers. Examples of superimposition of Pecked Cupule and IIA Period have not been found. The Erudite Epoch is divided into two art periods. The first, the Bradshaw Period, is followed by the Clothes Peg Figure Period. Archaic Epoch artists chose habitation-oriented sites with sandy floors for camping, the Bradshaw Period saw the commencement of a totally new direction of art and site associations. Art surface priorities appear to have centred around very particular rock faces, preferably vertical, and ideally consisting of hard and relatively smooth rock. Such specific surface selection criteria are not surprising when considering the incredible linework control and attention to minute detail that the artists incorporated in Bradshaw Figures. Art subject matter changes completely from the food-oriented fauna and flora of the Irregular Infill Animal Period to almost exclusively anthropomorphous forms in the Bradshaw Period. The rare examples of distinctive naked, undecorated, solitary ‘human’ forms of the Archaic Epoch are replaced by extremely elaborately dressed and coiffured individuals, holding a range of artefacts and interacting in group scenes. The average image size is 60–80 per cent smaller than those of the Archaic Epoch, and is accompanied by major changes in specifics such as paint application, brush stroke width and length, and infill forms. The first art period of the Erudite Epoch, the Bradshaw Period, commences with the Tassel Bradshaw group. A most interesting fact involves the ‘classic’ Tassel Bradshaw Figures simply ‘appearing’ in fully developed form in the lowest level of the Erudite Epoch’s superimposition sequence. There are no identifiable bichrome motifs within the Archaic Epoch art, but close examination of initially monochrome motifs of the Bradshaw Period shows that Mulberry Hue was certainly present in the Erudite Epoch. Unquestionable evidence survives of bichrome, and possibly polychrome examples within the Tassel Bradshaw group, but it is difficult to determine exactly how widespread was the use of multiple colour. More than a dozen closely linked groups and sub-groups can be defined as discrete identities under the loose umbrella of ‘Bradshaws’. Sash Bradshaws evolved out of the original Tassel Bradshaw group and are the second most numerous group of the Bradshaw Period. A number of examples of superimposition clearly show Sash Bradshaws over, but none beneath, Tassel Bradshaws. The Clothes Peg Figure (CPF) Period is a transformation from the Bradshaw Period, possibly happening over a relatively brief time frame and appearing to involve the same culture. While there are many identifiable similarities shared by the two periods, these figures are accompanied by sufficient clearly different features to identify the CPF art as a discrete period. Human form persists as the dominant theme, but adopts dramatically different appearances. Figures appear to continue to represent ‘real people’ rather than ‘deities’, but with increasing degrees of schematisation, which eventually parallel levels of idealisation exhibited in the earlier Tassel Bradshaws. The CPF art represents the development of a single form which finally becomes standardised, subsequently receiving rapid acceptance over a very wide distribution. This basic CPF form survives in a great many images. Surviving numbers of identifiable figures suggest that the CPF Period was similarly a product of either an incredible number of skilled artists over a short duration, or a smaller number over a considerable time span. Differential weathering on similar figures on similar panels suggests the latter. The CPF Period appears to come to a relatively abrupt artistic ‘end’ and, with it, the end of the Erudite Epoch. The Aborigine Epoch is basically believed to postdate the Last Glacial Maximum.The earliest following artistic works superimposing the Clothes Peg Figure involve motifs so totally alien in all respects that it is difficult to imagine that they originate from the same country, much less the same geographic region. There is little problemin identifying the later art forms, which collectively involve broad brush strokes, which at best could be termed a very ‘naive’ form. The fine brush strokes of obviously accomplished artists, portraying figures with clearly intimate understanding of muscular form, vanish forever from Kimberley rock art. This undoubtedly heralds the commencement of an easily identified and remarkably dramatic artistic change, which has been termed the Aborigine Epoch: the final art epoch of the Kimberley. 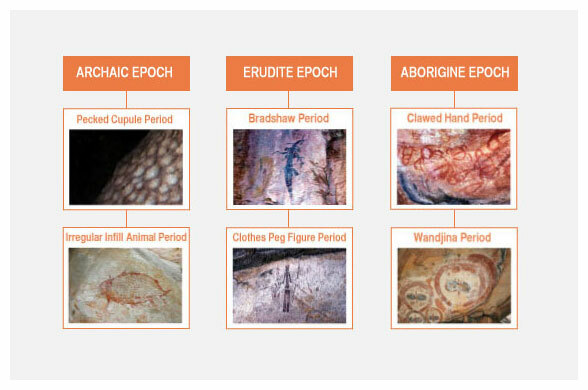 This Epoch indicates a number of minor cultural ‘pulses’, but there are at least two definable art periods, the Clawed Hand Period and the Wandjina Period, with the latter appearing to have been of much shorter duration than the former. Identifiable transitions, techniques and themes can be identified through the Aborigine Epoch which link it via definable stages to contemporary Aboriginal culture, hence the validity in terming it the Aborigine Epoch. This period has been named after one of the most consistently recurring (but not the earliest) motif: freehand painted variations of decorated hands, with long, claw-like ‘fingernails’, referred to as the Clawed Hand Motif. These hand motifs, approximately life size, incorporate varying geometric infill on the lower palm, and quite complex decorative infill develop in some of the later examples. Based on the tangible evidence of preceding artistic culture and obviously skilled artists, the appearance of early CHP paintings suggests the infrequent creations of unaccomplished artists who lack any formal artistic tradition. Possibly the paintings are the product of non-specialist members of a small, mobile, and widely distributed population. The limited and rather unimaginative range of early CHP art shares certain common stylistic traits. These include monochrome red linework, applied in crude, broad bands, at times to the standard of finger painting and daubing. Motifs are small, and largely display zoomorphic characteristics, but may be intended as anthropomorphous rather than zoomorphous beings. It is very difficult to study Wanjina evolution, as the practice of repaint (appearing to have developed in relatively modern times in the Late Wanjina Period), has effectively obliterated the majority of examples. outcrops, or dramatic shelters. These are geological features which are not uncommon in many areas of the harder sandstones of the north-west Kimberley. The spectacular shelters, and/or formations, are direct links with that hero(s) creation mythology, representing further tangible evidence of these hero(s) power and ability. I support the KFA because the rock art of the Kimberley region is a great treasure - it represents the cultural heritage and tradition of Indigenous Australians. The beauty and the spirit of the rock art lives on today. I am inspired by the work that the Kimberley Foundation does in preserving, protecting and promoting the significance and value of these great works.